The School of Mass Communication recognized outstanding achievements from students and faculty alike during the 2017-2018 school year at its annual awards banquet in Ledbetter Hall. Among those recognized was alumnus Patrick Rhode, who served as special assistant to President George W. Bush. Rhode left the School with only three credit hours left to complete but returned 23 years later to finish his degree after a conversation with his young daughter. Rhode served as the event’s keynote speaker, recounting the rocky beginning of his career and telling the audience that in college he never could have imagined that he would go on to work in the White House. Rhode encouraged students to stay committed to their goals, citing his own story as proof that success is possible even when the circumstances seem not to permit it. 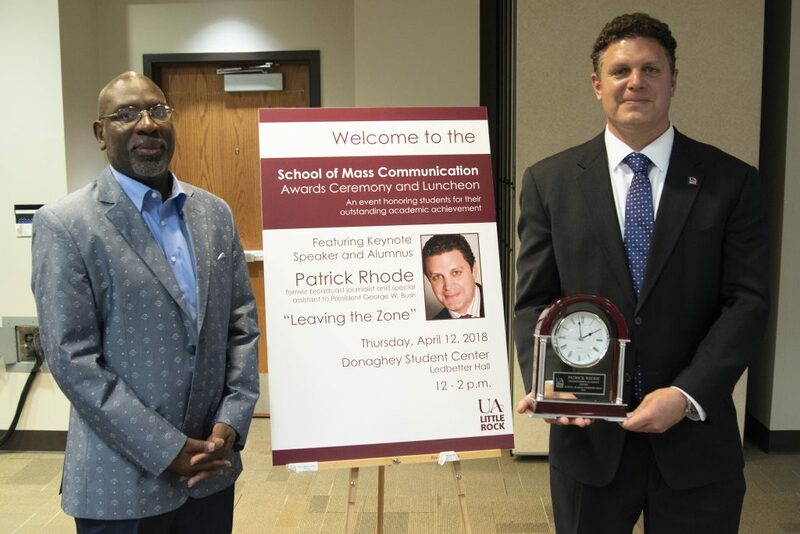 Rhode himself was presented with a Capitol Citation from Arkansas’ Secretary of State, a Certificate of Recognition from the State of Arkansas, as well as a Distinguished Alumnus Award from the School of Mass Communication.